There are a couple different cuts of pork ribs that can be cooked this way. Country style ribs are excellent when cooked this way. I don't recommend cooking baby back ribs using this method. This is a good method for cooking pork spare ribs, but not the best method. The beauty of this method is that it is easy and doesn't take a lot of work. The final product can be cooked so that the meat falls off the bones. If you don't like your ribs that done, then experiment with shorter cooking times. 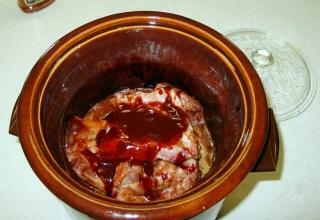 Crock pots vary greatly in size, shape, and most importantly in cooking temperature. Older crock pots, like the one shown in the picture above, cook at much lower temperatures than newer crock pots. This causes variation in cooking times and "doneness", so you need to check to see if your ribs are done earlier than expected, and make sure you do not over-cook or under-cook them. If you are cooking spare ribs, then a half a rack per adult is normal. If you are cooking country style ribs, then two or three "ribs" is enough for one adult. If you are serving these ribs at a cook-out (or barbecue) you can figure that people will also be eating other things, like steak and sausages, or hamburgers and hot-dogs, so you could serve fewer ribs. If you aren't serving other main courses, then you probably won't be able to fit enough ribs in your crock pot. In any case, fill your crock pot up to the rim. Left-over crock pot ribs reheat well, so don't be unhappy if you ever have leftovers. But be aware, if you are filling your crock pot to the rim, that the ribs at the top won't be cooked as well-done as those at the bottom of the pot. To remedy this, you may want to "rotate" your ribs about half way through cooking. That is, take all the ribs out of the pot; put the ones that were on top on the bottom, and the ones that were on the bottom on the top. If you really want the meat to fall off the bones, then, with spare ribs, you will want to remove the membrane from the back of the ribs before cooking. You can get it started by using a knife, but then get your fingers underneath to loosen it up and finally peel it off. For spare ribs, cut the ribs into portions with one or two ribs in a single piece. Country style ribs should be cut into single "rib" servings. Use your favorite barbecue sauce; personally, I like K.C. Masterpiece® BBQ sauce, or BULL'S-EYE® original BBQ sauce. You will probably need two bottles, depending on the size of the bottle and how many ribs you're making. If you would like to make your own BBQ sauce, here is a great recipe for BBQ sauce. Pour the whole bottle of BBQ sauce into a large bowl, and dip each rib portion in the sauce then put the rib portion in your crock pot. After you've put all the ribs into the crock pot, using a rubber scraper, get all the barbecue sauce from the bowl into the crock pot on top of the ribs. Add more barbecue sauce if you think you need more for the amount of ribs you have. Cover your crock pot and cook on low for a minimum of seven up to around eighteen hours. How long you cook the ribs depends on a lot of different variables, like how many ribs you are cooking, how big your crock pot is, the temperature at which your crock pot cooks, and how done you like your ribs. I find that cooking in a crock pot is good if you want the meat to fall off the bones, and have a wet sauce. The longer you cook the ribs the more they will "fall of the bone". I put my ribs in the crock pot the night before, just before I go to bed, as I like the longer cooking times when cooking ribs in a crock pot. About an hour before you serve the ribs, you may want to drain the wet sauce off the ribs and into a sauce pan. Start it simmering and cook the sauce down for about an hour. Or at serving time you could remove the ribs from the sauce that they cooked in, putting them on a serving platter, and then top with "fresh" BBQ sauce that is thicker. Or serve sauce on the side. However you do it, I'm sure the ribs will be tasty! Wondering what to serve with ribs?